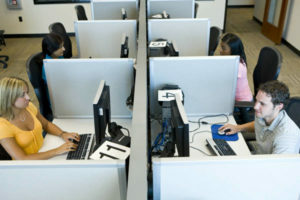 The IT testing center was an accredited space where clients could take training classes and certificate bearing exams. These were needed because university degrees no longer conferred knowledge or general competence. Hiring managers were similarly deficient and couldn’t weed out fakers from the experienced, and everyone was lying about their skills on resumes. It was damn expensive to pull experts from projects to filter interview candidates and few of the tech guys were going to do much with the conversation than be awkward anyway. The test center is run by the same type of people who pursue certification these days: immigrants from third-world countries with thick accents, trying their best to go along with British-like orderliness in accordance with regulations to prevent cheating. Those from former British colonies tend to do best with these systems. There was probably a lot of oppression used to teach the purpose of rules and law. The typical client is playing a game by accumulating certificates instead of functional experience. There are enough jobs that filter by certification and won’t test actual knowledge or reasoning ability. The client won’t get exposed for being a fool and some company will feel assured that there’s a guy running their systems with a bunch of silly certificates, even if it often seems he has no idea what’s really going on. After a few years, he’ll have come up with a system for hiding his mistakes that is good enough for most employers. When you see a rush of third-world talent heading to IT despite limited experience and interest in the fundamentals of their trade, it’s obvious they aren’t a suitable replacement of the previous generation that was deep in knowledge of how things worked. It’s also inevitable that there will be hilarious consequences from the hollowing out of standards. Just like a society going barren by cutting off the replenishment of its talent, no industry can meaningfully continue when replaced with half-wits motivated by greedy ignorance. Accreditation should be meaningful, not another money grab easily gamed by dull laborers.